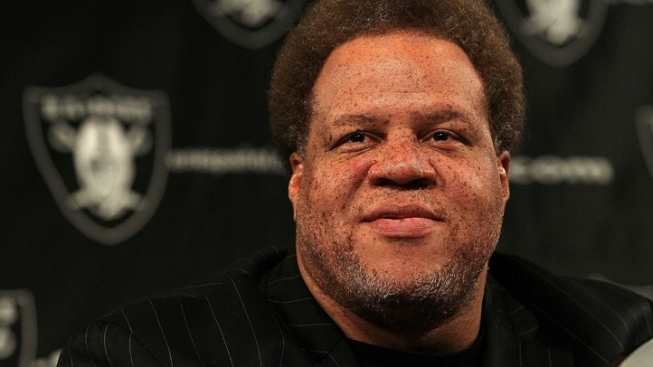 New general manager Reggie McKenzie was going to be the anti-Al Davis for the Oakland Raiders, a man who would make sensible, careful decisions about personnel. He wasn’t going to be wowed by 40-yard dash times, take gambles on high-risk prospects or make choices based largely on potential. Yet McKenzie’s first two picks in this year’s NFL draft were selections that appeared Davis-like. After taking cornerback D.J. Hayden of Houston in the first round Thursday, McKenzie selected offensive tackle Menelik Watson of Florida State in the second round Friday with the 42nd overall selection. Hayden is a talented prospect who’s coming off an injury to a major vein in his chest that required surgery last season. Watson is a former college basketball player from England who then took up football. Though he’s considered an exceptional athlete with great footwork and a big body (6-foot-5, 310 pounds), he’s also considered to be unpolished. Watson, in fact, has played less than 20 games of football in his life, including just one season at Florida State after playing at Saddleback Community College in Orange County following his basketball time at Marist. With Jered Veldheer entrenched at left offensive tackle, Watson will likely battle incumbent Khalif Barnes for the right tackle job in Oakland. While the pick of Watson raised eyebrows, McKenzie should be given credit for even having a second-round pick. Going into the draft, the Raiders had lost theirs in the Carson Palmer deal in 2011. But by trading down out of the No. 3 spot in the first round Thursday, McKenzie was able to pick up Friday’s second-round choice and use it for Watson. When the Raiders used their third-round pick Friday, McKenzie grabbed a more conventional choice in Connecticut outside linebacker Sio Moore (6-foot-0¾, 245 pounds), who had 72 tackles and eight sacks his senior season for the Huskies and played in the Senior Bowl. A three-year starter, he had 43 tackles for losses in his 274 total stops. When the draft resumes with the fourth round Saturday, the Raiders are scheduled to have the third pick (No. 100 overall).